Fundo Las Rosas received its name due to all the roses and flowers on the property. Watching cattle graze across pastures with a backdrop of snow capped peaks in the background and enormous rose and flower bushes in the foreground is almost surreal. The property is made of 2 parcels totaling 209 hectares (516 acres) along the Carretera Austral in the Patagonia Lakes Region of Chile. You might be familiar with the name Douglas Tompkins due to his philanthropy efforts. However if not, you most certainly are familiar with the name of the outdoor clothing and equipment brand he founded; The North Face. Douglas Tompkins purchased Fundo Las Rosa (The Rose Farm) in 2008 and began a complete restoration effort. Fundo Las Rosas received its name due to all the roses and flowers on the property. Watching cattle graze across pastures with a backdrop of snowcapped peaks in the background and enormous rose and flower bushes in the foreground is almost surreal. 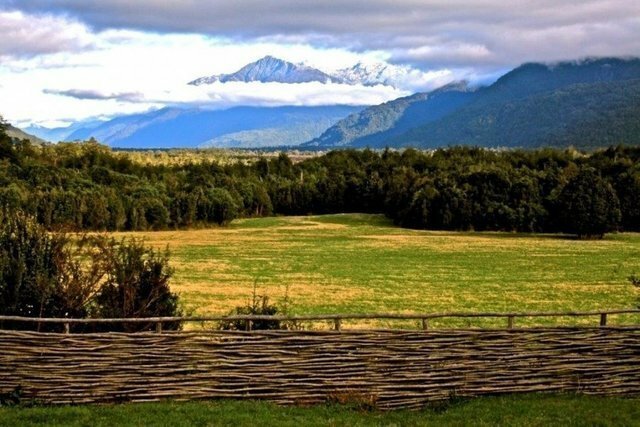 The property is made of 2 parcels totaling 209 hectares (516 acres) along the Carretera Austral in the Patagonia Lakes Region of Chile. The farm entails beautiful restored orchards and cultivated ground for growing fruits and vegetables along with native forests and grasslands. The orchards boast many heirloom varieties and a newer fruit and nut orchard. In addition, the farm produces approximately 500 liters of organic juices each year. There are plans in the works to establish a rustic sophisticated teahouse catering to tourists traveling the Carretera Austral. One will never tire of the views of the surrounding snowcapped peaks including Hornos Hill (Oven Hill) and Cascada Hill (Waterfall Hill) along with views of the Rio Amarillo that borders the property on the western property boundary. Fundo Las Rosa is located located just south of El Amarillo in Patagonia. Fundo Las Rosas is improved with a beautiful main home, guest house, shop, machine shed, and greenhouses. All structures are exquisitely constructed with no detail left out. The home is approximately 2260 square feet with 2 bedrooms each with ensuite bathrooms and the guest house is approximately 376 square feet. Fundo Las Rosas lies only a few kilometers from the entrance of Parque Pumalin which is one of the largest conservation initiatives in South America encompassing 715,000 acres. The park offers hiking and camping to the public to enjoy the many majestic views the park offers. In addition, one can enjoy hot springs, fishing, and many other outdoor activities in the area.